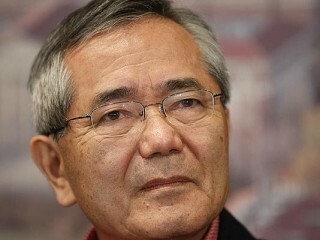 Ei-ichi Negishi is a Japanese chemist who has spent most of his career at Purdue University, United States. He is best known for his discovery of the Negishi coupling. He was awarded the 2010 Nobel Prize in Chemistry "for palladium catalyzed cross couplings in organic synthesis" jointly with Richard F. Heck and Akira Suzuki. Ei-ichi Negishi was born in Changchun, China while it was under Japanese rule, and studied at the Universities of Tokyo and Pennsylvania. He worked two stints of several years for the Teijin chemical conglomerate in Japan, before and after earning his doctorate, and then came to Purdue, where he worked alongside Herbert C. Brown, discoverer of organoboranes. Negishi researched the ways that a range of organometallic derivatives (aluminium, magnesium, zinc, and zirconium) are coupled in chemical reactions, and in 1977 he described Negishi couplings, a cross-coupling that uses organozinc derivatives to generate the palladium catalyst. Advancing the work of Richard F. Heck, palladium-catalyzed cross coupling is now the standard method for linking carbon atoms together and forming a stable framework for organic molecules. The work of Heck and Negishi was later taken further by Japanese chemist Akira Suzuki, and Negishi, Heck, and Suzuki shared the Nobel Prize for Chemistry in 2010. Practical applications of their research include the development of drugs to fight cancer and the manufacture of light-emitting diodes used to make untra-thin television and computer screens. View the full website biography of Ei-ichi Negishi.